No you can do it, please dont get yourself messed up! I find myself increasingly worried about her health, a sign of good writing and characterization. Come ON, Colleen... that's why you became a cleric, right? To do the Highfather's work of protecting the people from the horrors that can and do exist. Button up that fear and use it to put weight behind your mac-- your buckler swings! That's still a good bludgeoning weapon, right? This is a great page. Those are some truly disturbing monsters! I hope both of our mostly-sane adventurers make it out alive and intact. Looks like Colleen is having a sanity check now. Also a better look at what the skeletons are hiding in there heads. May be not fungi powered but the centipedes are controlling the skeletons magically? Not quite, but you're on the right track. I thought undead dissolved under prayers... these are undead reanimated with fungus right? If I understand it correctly, these are not real undead, they are bones animated by whatever the fungal aberration it is that's infesting this place. *Shakes cane* That's "Will" Save, you damn kids! 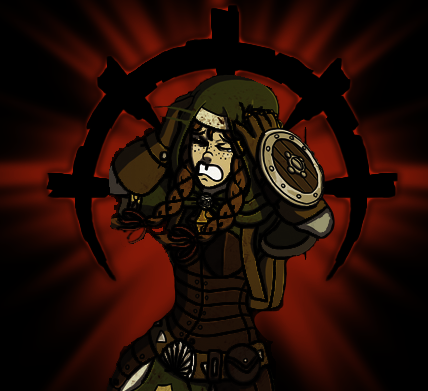 So many darkest dungeon jokes... how can the mind withstand such an assault? Quite agree with Ms Colleen. Nicking your weapon is cheating. Lucky she remembered to bring a back up. She did bring a backup, didn't she? Does that make her a dual class Cleric/Barbarian? I enjoy this comic greatly (Even opposed to the many fantasy comics) as it goes away from the ever-flowing systems of anime-esque magic and fighting, and settles in more concrete dungeoneering and well-defined spells. Keep it going, and well done. Thanks so much! There's a huge glut of hyper-fantastical, over-the-top magical powered, anime-inspired comics out there right now. I'm glad I was able to separate my comic from them at least a little bit! Yo thats some sickass fungi monsters. I really like the more grounded fantasy feel you've created. Thanks a lot for saying so! You know, Colleen probably needs a couple of days off. Just to catch her breath, you know? for having virtually no legs, That dwarf can JUMP. or... Did he just hit the centipede so hard he lifted himself off the ground... about his own height... O_o' Not gonna piss him off.